Shopping, fluffy pancakes, more shopping, Hello Kitty, Giant robots and a rainbow goodnight. All describe our second day of adventures around Tokyo. A collage of our PB&J Day 2 adventures! Day two of our Japan adventures took us around our favorite shopping spots in Tokyo. Besides incredible food around every corner, another thing you'll find plentiful in Tokyo? Shopping! Tokyo is literally covered with various shopping malls, boutiques, unique store fronts, etc. It's a shopping lover's dream come true. Here you can find anything and everything to suit your shopping wants and needs, from electronics, cute stationary, clothing, amazing home goods and more. So you can bet that if you head out to Tokyo, you will come home with at least one fun item from your travels. Another one of my absolute favorite spots in Tokyo is the Harajuku area. 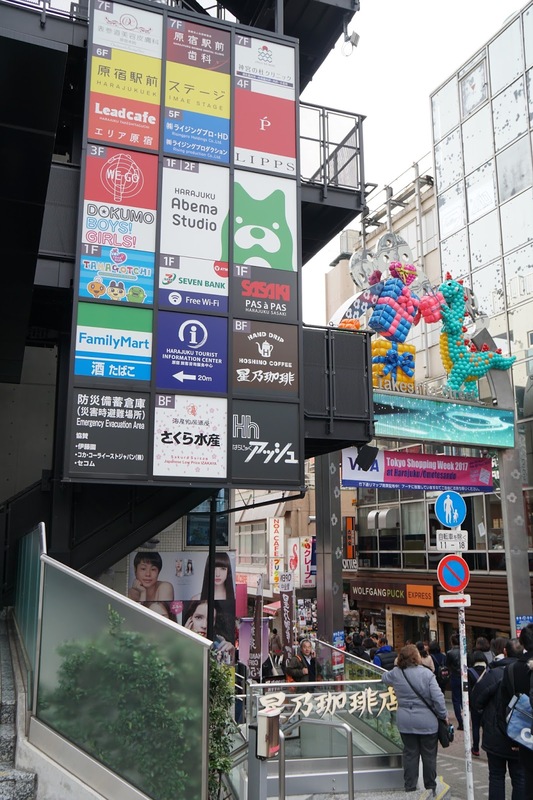 Home to the famous Takeshita Dori, Omotesando Street, Kiddyland and more! To start, located right off the JR Harajuku train station is the amazing Takeshita Dori. 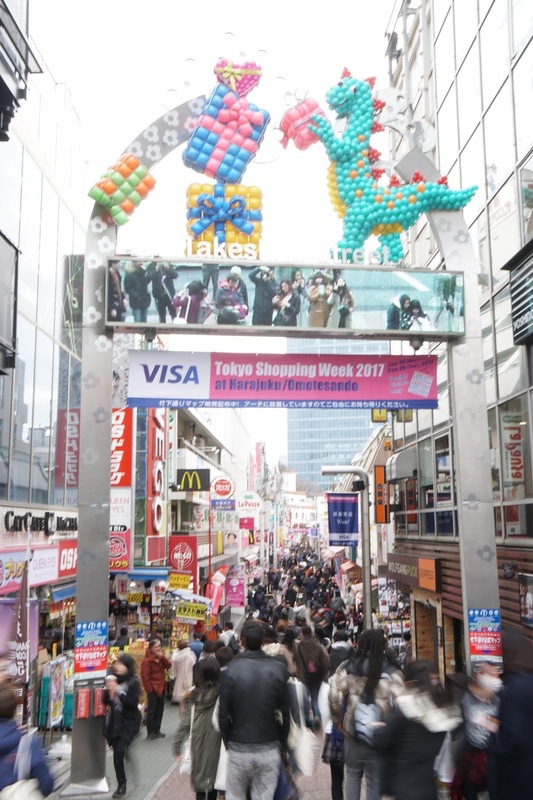 It's a pedestrian street spanning over a few blocks with tons of shops, food options, cute theme restaurants, and more! The famous Takeshita Dori aka Kawaii heaven! Our "Hope & Hearts" mascot came along for a day of adventure! This street is a shopper's delight if you're looking for anything super "kawaii" cute, pastel and absolutely adorable. Down this street are tons of little shops featuring almost everything. A tip for my fellow Disney lovers? This is the place to be on the lookout for some of the most fun Disney items you'll find outside of the official Disney Store and the Tokyo parks. There's so many Disney treasures to be found in this area of Harajuku. On my most recent trip I stumbled into a store and found the cutest Disney sweaters! If you're in need of a Disney fix, there's also another official Disney Store Japan location located close to the entrance of Takeshita Dori in the Alta building on the 2nd floor. There's some fun food options found down this street as well. 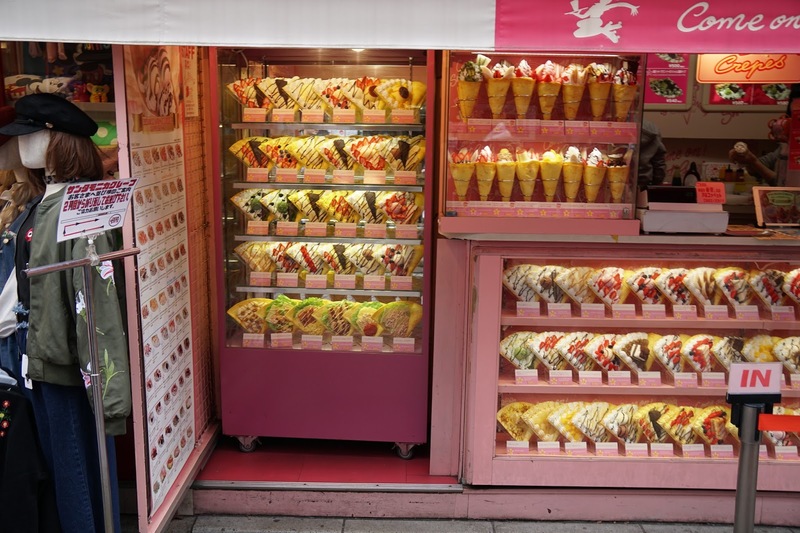 If you look up #Harajuku or #TakeshitaDori on Instagram you're bound to see multiple photos of people holding giant cotton candy balls or the yummiest looking crepes. At the end of the street, you're poured back out onto the main road in Harajuku. Here you'll find more shopping and one of my most favorite Disney style finds: Diana Shoes! If you've followed me on IG you know how much I love their Disney shoe collections. I discovered them a few trips back and have been in love with their fun take on Disney shoes. Here's a peek at their most recent collection. Yummy and fluffy pancakes with fresh cream and fruit toppings. NOMS! Definitely worth a try when you're in the area! The pancakes were crazy good, they're prepared fresh and the batter and actual pancake were as light as air. SO YUMMY! The owner and chef of Rainbow Pancake was super friendly and even helped give us dining tips for later on in our trip. 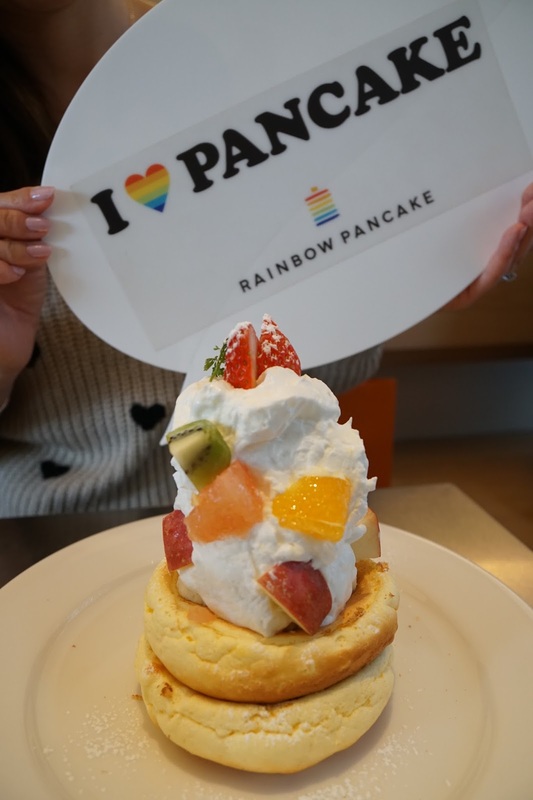 Rainbow Pancake definitely gets a PB&J seal of approval when it comes to noms-worthy Tokyo eats! You'll find that Harajuku has a ton of adorable little side streets filled with the cutest shops and cafes. But one amazing shopping stop is located off the luxe, tree lined Omotesando street in Harajuku: Kiddyland. This is a "must stop" for any Disney fan! There store houses multiple floors of different toys, games, plushes and more featuring your favorite cartoon, childhood and Disney characters. Here you'll find Totoro items, Hello Kitty goodies and of course, Disney merch. After getting our fill of Harajuku fun we hopped on the train and headed east to Odaiba. 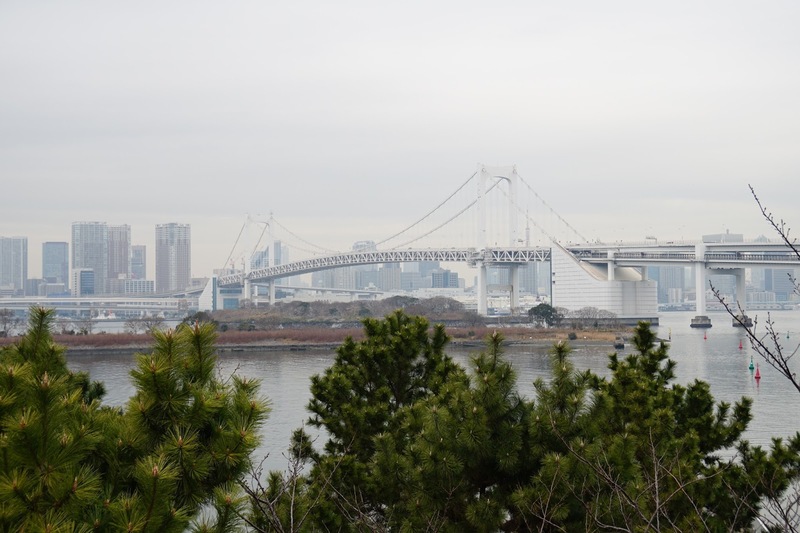 Located on the Tokyo Bay, this area features more, you guessed it, shopping. It's a fun area with serval giant malls located on the water, but we were there for a specific reasons. PB has been a fan of building Gundam Robots. I'm not sure how to describe these guys, but they're basically Japanese fighting robots? Lol. PB is always such a trooper when it comes to my Disney obsessions, that the least we could do on our trip was to partake in some of his favorite Japan obsessions. Located off of the Diver City building is a giant life sized version of an actual Gundam Robot. On the 7th floor is an amusement park type area called "Gundam Front" and features photo ops, a Gundam lab and more robot geekery that PB was super excited about. Early Sakura (Cherry Blossom) sightings in Odaiba! Spot the PB&J inside the giant Gunam robot! After nerding out with robots, we stumbled onto Hello Kitty heaven! There was a giant Hello Kitty Japan store, along with a tiny food kiosk selling the cutest HK themed soft serve treats. A few floors up there's a full blown Hello Kitty Cafe called "Cafe de Miki with Hello Kitty". The food is all themed and there's even a giant Hello Kitty or My Melody plush sitting as a guest with you at each table. One obsession both PB and I can definitely agree on? UFO claw machines! PB gets sucked into the games and usually won't stop until he wins whatever he puts his mind to. Hehe, that definiely worked in my favor when I saw this little (big) guy! Thank you for reading along with our day 2 adventures! Up next on the recap? TOKYO DISNEY!!! I already know these upcoming Tokyo Disney posts will be an overload of Disney park goodness, so stay tuned for all the fun in store! Loved following your Instagram during you travel so many places and things I have made a note of for when I go myself. So excited to read about your Tokyo Disney Trip! Welcome to our PB&J Adventure Book!